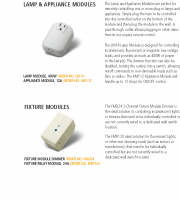 Lamp Module - Alarvac Systems Inc. The Lamp and Appliance Modules are perfect for remotely controlling one or more plug-in lamps and appliances. Simply plug the item to be controlled into the controlled outlet on the bottom of the module and then plug the module in the wall. A pass-through outlet allows plugging in other items that do not require remote control.